Barbra asked me to write a post about my three favorite web tools, and it was truly a great start to blogging and a huge opportunity for me! Im deeply thankful for giving me this chance to have my own post on her award winning site. I wrote about Twitter, Wordle, and Popplet and how can we use them to promote the 21st century skills. is one of my favorite web2.0 tool, its dedicated to having a creative work space for hundreds of ideas, combining stickynotes , a breeze mind map, a presenter and a multimedia tool, all in just one platform that can present visual ideas in a multiple work spaces. It is an easy tool that even a kid can use it. Popplet is similar to various tools like stickynote and mindmaps ones, for example, you can use Sticky Sorter or WallWisher for adding sticky note, Xmind and prezi as a presentation tool! First of all create your popplet by signing up, that won`t take much time , just add a name to it, then double click to add a box ( bubble) , you will have then to choose a background color for each box on your work space , and many other options for every bubble like the text font size, a pend drawing with many colors available , and the sharing button where you can upload an image from your PC, or bring a picture from flicker, a flicker and you can add a youtube video, or even a google map! with the ability to move the box and drag it in the workspace. - Online + Offline presentation. -Integrate text, upload image from your PC. - Add youtube links, flicker pictures, google maps, and amazon pictures. - Share it using social media like twitter, facebook or embed it to a blog. -Allow access to multiple users by email. - Bookmarklet that let you clip images and text from other websites and post them to your popplet boards. - Export it as a JPG or PDF file. - Comments on boxes or bubbles. With all these features, can you imagine the endless opportunnities for using this tool in the classroom, and how many creative ideas you can come up with ? - Presenting historical events: use the timeline option with the lines and multi-media to create a historical model for an event. - Learning a new language: Mind map is a great way to learn a language because it utilizes both sides of the brain effectively with the " pictures+ words + lines" features. - A brainstorming "Creative thinking" tool : you can use it to trigger creative thinking in a workspace that can be expanded , recording class notes , or the generated ideas in a brainstorming session. - Project Based Learning : popplet can be used for group work, with the add user option, multiple space for many users, and the ability to add elements like pictures, text and videos will be an effective platform for project based learning. - Beyond the classroom walls / Parents / Global: Students can share their work with parents or other students from another country in real-time. - Storytelling: Timelines will mutlimedia can be used to tell a story. - Summarizing : Students can summarize ideas from a book or an essay they read in the classroom, teachers can also present the main ideas of a lesson. - Organizing: Mind map is also a great way to organize thoughts from a brain stroming session. - ScrapBook/ School or class photo albums /Posters : popplet final projects can be exported as JPG or PDF files and you can also print it. - Introducing/ presenting new topics. - Producing documentaries like this example. - Differentiation / Visual learners. - Planning for a unit / essay. - Feedback : using the comment option for commenting on generated ideas/ boxes. - Homework and assignment : Print it, or use it online and fill in the blank. Please check out my popplet for this post! 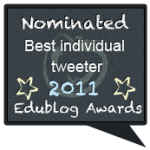 I would love to share some of the great resources my PLN has shared on Twitter! Can Social Media in the Classroom Encourage Critical Thinking? 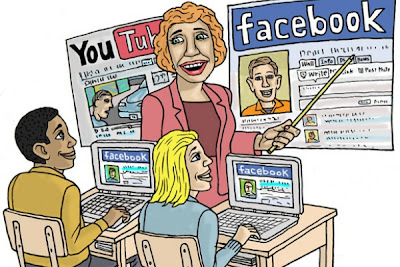 How Young is Too Young for Kids to Start Social Networking? Social Media: Is it for Kids? And some great articles here.